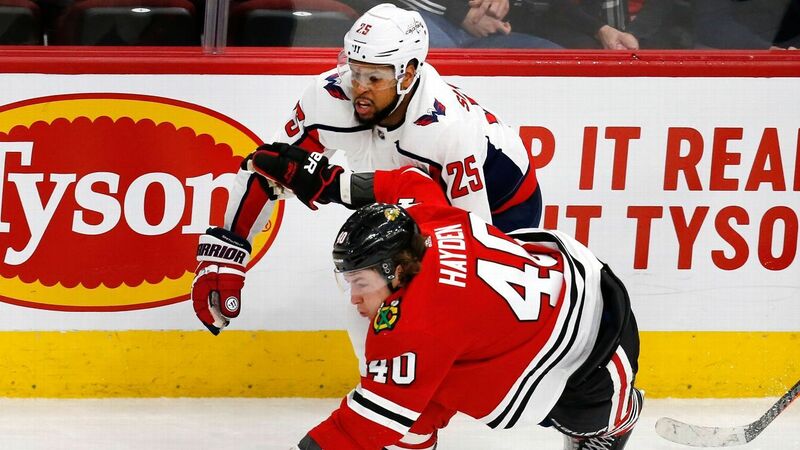 CHICAGO – Washington Capitals winger Devante Smith-Pelly returned to Chicago on Sunday for the first time since he was the subject of racial taunts by fans during a game. In February, 2018, the Blackhawks ejected the four fans who harassed Smith-Pelly in the penalty box and, a day later, banned them from the United Center for life. The Capitals fell to the Blackhawks, 8-5. Smith-Pelly, one of about two dozen black players in a league of more than 700, typically plays on the fourth line. However Capitals coach Todd Reirden made Smith-Pelly a starter on Sunday, alongside Alex Ovechkin and Nicklas Backstrom, so Smith-Pelly would be able to stand on the ice during the national anthem. The 26-year-old is in his eighth NHL season, and second with the Capitals. After scoring just seven goals last regular season, he emerged as an unlikely postseason hero with seven playoff goals, including two game-winners and six in the third period or overtime, as Washington won its first Stanley Cup. The incident in Chicago last year included fans shouting “basketball! Basketball!” at Smith-Pelly, who grew up in Scarborough, Ontario. The coded language implied that Smith-Pelly did not belong in hockey, a predominantly white sport. Smith-Pelly said it was not the first time he was subject to racial taunts from fans, but it was the first time he felt comfortable speaking out about it. On Sunday, Smith-Pelly served a two minute penalty for unsportsmanlike conduct during the second period but said there were no issues with fans while he sat in the box. Chicago Tribune columnist Steve Rosenbloom ran an email from a reader suggesting that Blackhawks fans donate to a charity of Smith-Pelly’s choosing as a gesture of apology. Smith-Pelly said he’d like money to go to Fort Dupont, the only full-size indoor ice arena in D.C. and home to the Cannons, the oldest minority youth hockey program in North America. As of October, the rink received $37,488 from more than 300 donors in Smith-Pelly’s name. Earlier this month, Smith-Pelly and the Capitals hosted a 14-and-under travel team based in Maryland after they found out that one of their players was also the subject of racial taunts in a hockey game.